Eve Online’s latest attempt to expand its universe with a shooter is Project Nova, and unlike its predecessor Project Legion, it’s actually happening. If you’d like to read more about Eve’s many attempts to straddle the shooter genre, Jeremy asked CCP about Project Legion back in 2015. Nova will be playable on PC in “months not years”, with a more detailed reveal sometime before then. Like Legion and the ill-fated Dust 514, it will ultimately be connected to Eve Online, but that integration won’t be live at launch. The news comes via Hilmar Veigar Pétursson, CEO of Eve devs CCP. Speaking today at Fanfest, their annual community event, he says Nova’s moment-to-moment gunplay experience will be the most important thing. I played a bit of Dust and let me tell you, that’s reassuring to hear. 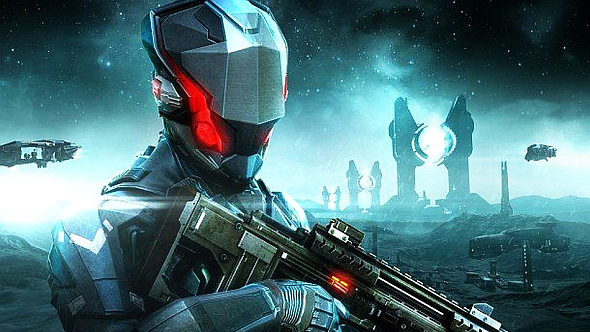 If you didn’t hear about Dust 514, it was a free-to-play PlayStation 3 exclusive shooter. Players fought in real-time on planets that could actually be found in Eve Online. Eve players and corporations would hire Dust players as mercenaries to fight for control of those planets, and could even support them directly via orbital bombardments – dropping bombs in Eve, to kill enemy players in Dust. We’re told that Nova is already “shaping up to be a unique multiplayer shooter,” but that was never in doubt – Dust’s big idea was years ahead of its time, it’s just a shame the game itself wasn’t that good. With Nova, it sounds like the focus is on making a solid shooter before hooking it up to Eve, but the ultimate vision of “one universe, one war” remains intact, and still sounds pretty thrilling. You can sign up to a mailing list for more info here.